… To Give Your Dog The Best Sleep Ever. Pressed for time? Skip the fluff and jump to our review table. Or jump straight to the reviews. When your dog is young and in tip-top shape, there’s not a surface around where he or she can’t plop down on and have a good night’s sleep or quality nap. However, just like humans, as dogs age, they often have a harder time settling down and finding a comfortable resting position, not to mention the possibility that it might be harder for them to fall asleep. Which is where orthopedic dog beds come in. The time to give your pooch a bed upgrade is now! 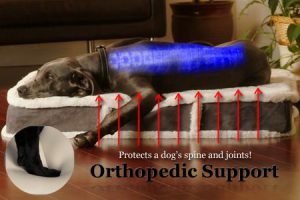 Many orthopedic dog mattresses are made of memory foam which do not collapse under your dog’s weight, but stay firm and provide necessary support for his or her bones and joints, alleviating pressure points caused by gravity. 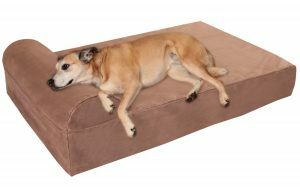 Big Barker’s 7” Orthopedic Dog Bed with PillowTop is designed specifically to support large- framed dog breeds. 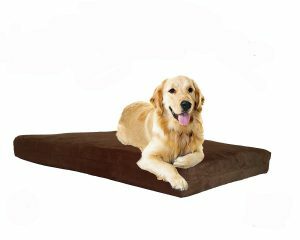 The large size is best for Retrievers, Boxers, and other muscular dogs under 25” in height. Extra Large is for taller working dogs, such as Rottweilers and Saint Bernards, and the Giant model was designed specifically for the unique needs of Great Danes. It features a removable durable microfiber cover that is easy to clean and does not retain odor. Big Barker produces all of its products in the USA so you can be guaranteed of the high quality of products used in their manufacturing. Dimensions: Large (48X30X7), Extra Large (52X36X7), Giant (60X48X7). Color: Khaki, burgundy, charcoal grey, and chocolate colors. The vast majority of people who have actually bought this product were most impressed by Big Barker’s support of their dogs’ joints and ability to withstand wear & tear for the full length of the warranty, without sustaining any major damage. Some people recommend buying beds on the longer side if your best friend enjoys sprawling out in bed. The primary critiques were the lack of waterproof lining and relatively high cost when compared to competitors. 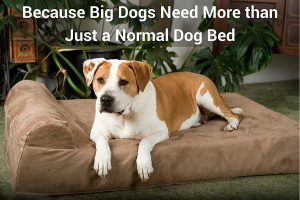 Big Barker’s 7” Orthopedic dog beds are among the largest and priciest on this list, but when you consider that almost 3,000 people have made the worthwhile investment in this mattress, then you should know it it worth every cent you will spend. Arf’s Orthopedic Mattress for Dogs is made of solid therapeutic memory foam which contours to the shape of your dog’s body and offers many years of comfort and relief from pain caused by arthritis, stiff joints and hip displacement. The mattress comes with a two-layered cover that includes a white waterproof inner-liner, and a %100 polyester external layer made of durable chocolate-colored faux-suede. The cover is easily-removable and machine washable, making it easy for you to keep your dog’s bed fresh and clean at all times. 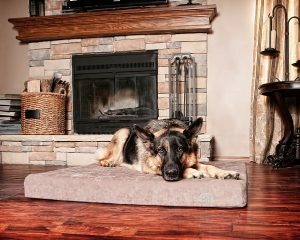 Arf dog beds are most popular with large dogs and their people, and are best for older dogs with stiff joints and hip dysplasia. With the easily-removable cover, it’s also rather easy to keep clean. The main concerns noted were the thinness of the removable outside cover, and the fact that this mattress cannot be used outside or at below 50F long-term. K9 Ballistics Orthopedic beds are hypoallergenic and can easily be machine washed in cold water. It features premium, upholstery-grade microfiber siding with a plush and lofty faux fur sleeping surface. The 5 inch thick orthopedic mattress consists of a 1.5 inch layer of memory foam atop a 3.5 inch layer of dense support foam for optimal comfort. Colors: Cream fur/grey blue micro, grey black fur/dark grey micro, cream fur/tan micro, grey black fur/black micro. these K9 Ballistics Orthopedics beds can accommodate dogs of multiple sizes and weights simultaneously, and the memory foam supports each dog’s body shape. There were no actual complaints about chewing or scratching. one reviewer spoke of the bed’s outer layer shesd and needs to be brushed on occasion. 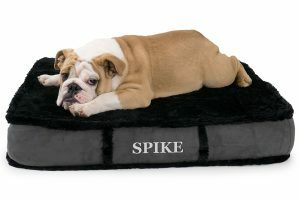 This orthopedic dog bed will excite both you and your dog. The LaiFug Memory Foam Extra Large Dog Bed is ideal for even the largest Best Friend; dogs weighing up to 200 pounds can stretch out and get maximum support on this highly supportive mattress. It is exceptionally good for pets with arthritis or joint and muscle Issues, giving them the ultimate chance to relax and rejuvenate after a long day or work or play. 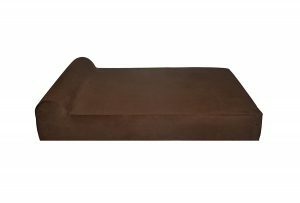 It is available in, and features a soft faux suede cover that is both super-comfortable and washable. 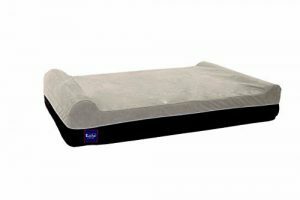 It also includes a waterproof liner between the removable cover and memory foam, making the beds clean and hygienic. 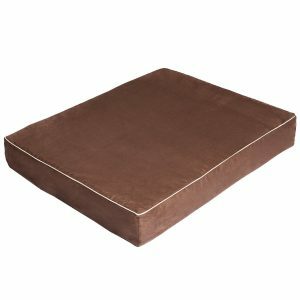 Because of the limited number of reviews that this orthopedic mattress has we were unable to find a lot of user comments and experience in with this bed. However, the limited number of people all had positive reviews, such as the bed being firm and supportive, never flattening, and the cover being is easy to clean. One reviewer’s 110 lb. dog’s toes sank through to the floor when it stands up on the bed, yet it moved around them like a waterbed. They were unable to get a refund. 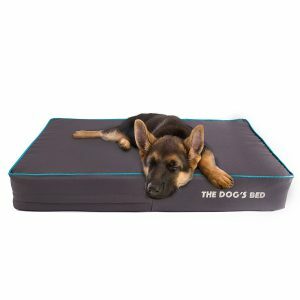 Dog’s Ball premium orthopedic waterproof memory foam beds come with a waterproof removable and washable inner layer which protects the mattress from accidents and incontinent issues. Wash the cover & inner layer separately with the zipper closed, preferably by hand or on a gentle wash cycle. The fabric is resistant to mold, mildew and dust mites and can also be used as an outdoors bed. It also features excellent medical grade orthopedic support for older dogs, offering therapeutic relief for arthritis pain, stiff muscles, hip dysplasia, and aching joints, contouring perfectly to your dog for maximum comfort and a top-notch rest. Colors: Grey, Grey/Pink, Grey/Orange, Grey/Green, Grey/Blue, Grey Plush Top, Brown Plush Top, and Grey/Black. The beds are very comfortable and supportive of older dogs with arthritis, and the cover is easy to remove and clean. Customers caution about getting the interior wet, as it can take a long time to dry out. The cover is rather lightweight, and may fray after being washed a few times. PetFusion’s Memory Foam Dog Bed’s smart design includes the following features: base & bolsters which provide optimal support and comfort, a water resistant & tear resistant cover, and a non-skid bottom. Additionally, blends in seamlessly with your décor. Replacement covers are also available separately. It is easy to clean with a removable, machine washable cover, and is simple to spot clean & remove hair. 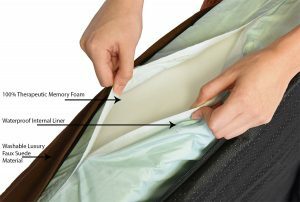 Lastly, it offers simple, hassle-free assembly: ‘bolsters’ (couch arms) pre-loaded in fabric cover–simply insert memory foam base and zip closed. Easy to clean and assemble, well suited for all breeds and sizes of dog (as well as cat and human! ), with very effective memory foam. Several customers claimed they found the mattress too soft and giving. Another said the sides were not high enough, and her dog rolled off the bed in his sleep! This unique bed utilizes cutting edge Tru Cool memory foam, scientifically calibrated to promote joint health. The luxury gel utilizes high tech Crypton performance fabrics which allows it to stay clean, avoid orders, and rarely needs to be washed. 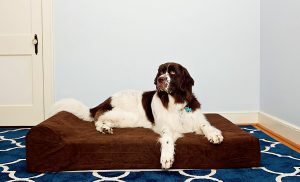 What’s more, this bed is chew-resistant, guaranteed to last ten years, and handmade in the USA. Colors: Champagne beige, dark chocolate, fathom grey, and iced mocha. The Buddy beds are very durable and will almost certainly outlast the 10 year warranty–the high upfront price is more than made up for by the money saved avoiding replacements. The cover is easy to clean and remove dog hair from. One reviewer stated that it was not entirely waterproof, and a small amount of urine soaked through onto the mattress, itself. 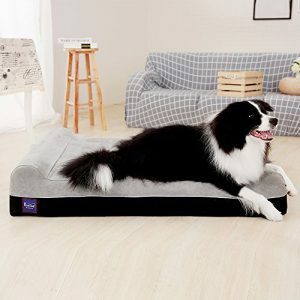 Friends Forever Premium Orthopedic Dog Bed/Lounge features a removable cover that is fur & hair-resistant, anti-tear, and machine-washable; the cover than be removed by unzipping its YKK pure metal zippers.Beneath the cover, the bed has a 100% suede memory-foam base. The XL bed can support dogs up to 100lbs who enjoy a good, healthy sprawl. One year full warranty. the beds are easy to assemble and clean, and the memory foam works quickly and effectively around dogs big and small to offer optimal support to their bones and joints. The primary complaint among reviewers was that the zipper was of inferior quality and tended to jam or break when removing the cover to be washed. Pet Support system makes only medical grade quality 100% hypoallergenic 4 inch Certi-Pur certified foam pet beds, featuring 2 inches of high density NON-TOXIC supportive base foam and a 2 inch 4 lb memory foam top. The accident-proof inner lining protects the foam from absorbing any accidents or bodily fluids from your Best Friend. Pet Support Systems pet beds are made to last and to be as user friendly as possible. The superior foam and inner waterproof lining is covered by a durable zippered removable denim fabric. What customers are saying: high quality memory foam; a bargain for a Certi-Pur certified bed! It is very good for supporting older dogs with arthritis and joint problems, though the height can make it difficult for dogs with highly limited mobility to climb up and down. The outer cover is comfortable and attractive, but the waterproof inner sleeve is flimsy and may tear. Simien Large & Extra Large Dog Bed includes a waterproof liner, a 9” Pillow Top Headrest, a Non-Slip Bottom, and a free nutritional supplement and eBook on dog health. Simien uses Certipur, which is free from fillers that usually contain toxins harmful to your dogs, and is the highest quality foam available in the market. Beds come with covers which are 100% microfiber and easily washable. A great investment for large dogs who need a lot of support for their joints and bones. It is very sturdy and can handle lots of wear and tear over the years.